Synthetic peptide corresponding to Human SKP2 aa 2-20 (N terminal). Different from the related rat and mouse sequences by three amino acids. Our Abpromise guarantee covers the use of ab68455 in the following tested applications. WB Use a concentration of 1 µg/ml. Predicted molecular weight: 48 kDa. ICC Use a concentration of 1 - 2 µg/ml. Acetone fixed cells. Antigen retrieval by Pepsin and Trypsin is required. Substrate recognition component of a SCF (SKP1-CUL1-F-box protein) E3 ubiquitin-protein ligase complex which mediates the ubiquitination and subsequent proteasomal degradation of target proteins involved in cell cycle progression, signal transduction and transcription. Specifically recognizes phosphorylated CDKN1B/p27kip and is involved in regulation of G1/S transition. Degradation of CDKN1B/p27kip also requires CKS1. Recognizes target proteins ORC1, CDT1, RBL2, MLL, CDK9, RAG2, FOXO1A, UBP43, and probably MYC, TOB1 and TAL1. Degradation of TAL1 also requires STUB1. Recognizes CDKN1A in association with CCNE1 or CCNE2 and CDK2. ab68455 at 1µg/ml staining SKP2 in Human mammary cancer tissue sections by Immunohistochemistry (Formalin/ PFA fixed paraffin-embedded tissue sections). The tissue underwent enzymatic antigen retrieval in pepsin and trypsin. A Biotin-conjugated Goat anti-rabbit IgG was used as secondary at 1/200 dilution. Additional bands at: 29 kDa, 38 kDa. We are unsure as to the identity of these extra bands. The predicted molecular weight of SKP2 is 48 kDa (SwissProt), however we expect to observe a banding pattern at 53 kDa. Abcam welcomes customer feedback and would appreciate any comments regarding this product and the data presented above. SKP2 was immunoprecipitated using 0.5mg Hela whole cell extract, 5µg of Rabbit polyclonal to SKP2 and 50µl of protein G magnetic beads (+). No antibody was added to the control (-). 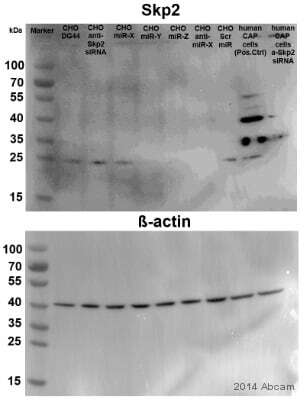 Proteins were eluted by addition of 40µl SDS loading buffer and incubated for 10min at 70oC; 10µl of each sample was separated on a SDS PAGE gel, transferred to a nitrocellulose membrane, blocked with 5% BSA and probed with ab68455. Publishing research using ab68455? Please let us know so that we can cite the reference in this datasheet.